Home > miscellaneous	> Photobomb! 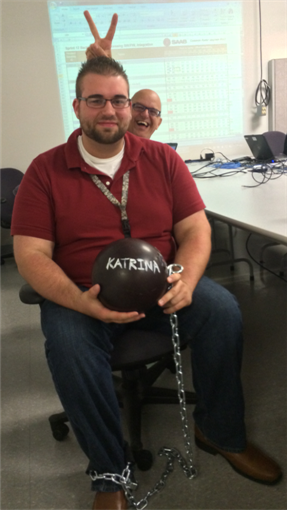 With teammate Corey P.’s wedding date looming on Saturday, we broke out the old ball-and-chain and cuffed him to it for the day. If you haven’t guessed, the name of his fiancee is Katrina. And yes, that’s the inimitable BD00 in the background doing what he does best – mucking up the worx like a juvenile delinquent .